i went to my first dallas stars game tonight. it took 10 years!? nuts! my sister’s boyfriend invited 3 of us to the game, and i was excited ALL DAY TODAY. i love watching sports live!!! final score: dallas stars win vs. los angeles kings, 5-1. i even got me 5 coupons for free tacos at taco bueno! derek and i during 2nd and 3rd period! next up, dallas cowboys games and longhorns games!!!! 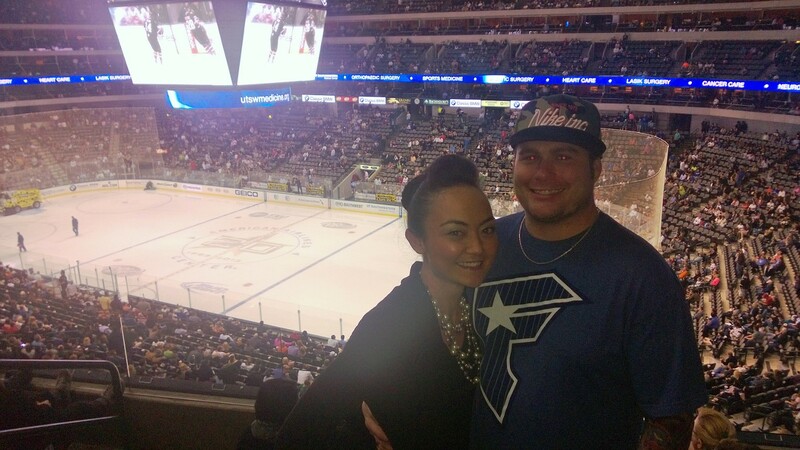 This entry was posted in dallas, hockey, sports and tagged american airlines center, dallas stars, los angeles kings. Bookmark the permalink. Nice! I love going to sporting events as well…and hockey is MUCH better watching in person! when i was young,my dad’s company had season tickets to the NY Rangers, four rows up from the ice. there were six of us so every other sunday, he would take three of us in to the city. we all learned to love hockey and the trip with our dad was pretty special too. I’m glad you finally got to a game 🙂 Hockey rocks, yes, especially when you’re there and can smell the sweat! Wanted to thank you for your visits to foodforfun–glad if you liked the Top-Secret Cupcakes.